It has now been a year since countries signed on to the UN Sustainable Development Goals (SDGs) and some months after they ratified the Paris Climate Agreement. These global goals now truly unite us, but how can individuals relate to them at the national and local level? This was the focus of the recent Forum for the Future of Agriculture (FFA) Regional Conference, held in Ljubljana (Slovenia) on December 2. The world has agreed that drastic changes are needed to our attitudes and ways of handling problems such as climate change, halting hunger and biodiversity loss, but how can we best achieve this change? Janez Potočnik, Chair of the FFA, argues that we must move beyond our traditional sectorial thinking and move towards a unified approach to our whole food chain; this would be the first step to changing our economic system towards a sustainable one. When we only discuss with farmers and tell them how to best manage their land, we are only looking at one part of the exercise. Purchasers, retailers and consumers are just as vital part of the food chain as the farmer is. Thus, if we are to change the whole, we must reorganise our governmental systems so that it can approach the problem in its entirety, rather than a segmented institution that cannot. Mr Potočnik highlighted that the FFA was designed as a space where holistic solutions can be sought by providing a platform for common discussions between those with different views but pragmatic attitudes. How can a small country like Slovenia contribute to these global commitments? While agriculture is a small sector compared to other neighbouring countries it still has an important role to play in providing livelihoods to people in the countryside. Slovenia’s agriculture is mainly comprised of small farms with 84% of holdings having land under 10 hectares. Farmers have a hard time to be profitable due to high input prices and many depend on the safety net the Common Agricultural Policy provides. 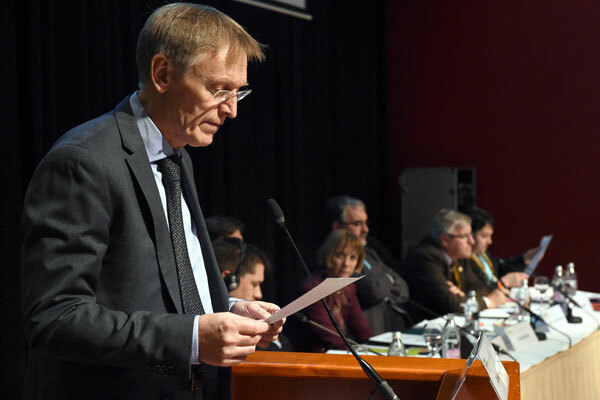 Mr Potočnik explained that while there is an understandable desire for food to be as cheap as possible, farmers must also be able to sustain their enterprise through decent farm-gate prices. Targeted measures that decrease the price of food may therefore be counter-productive on the long term, and efforts to feed the hungry should be focussed through a better social support service. An overabundant and cheap food supply also leads to overconsumption and a large measure of food waste. Both of these are both bad for the individual and the environment. We must re-design our supply systems to not just make sure that all products are used efficiently and recycled as much as possible. Shopping smartly, recycling and planning ahead should be part of every citizen’s life. Technology and innovation will have a vital role to play in meeting the challenges of the SDGs and the Paris agreement, both locally and across the EU. There is enormous technological potential to support sustainable agricultural production. Europe and its citizens should endorse and embrace these systems which can be beneficial for all. However, none of the above changes can be made without the right policies and regulations. Until all stakeholders start listening to each other and become willing to compromise, the right solutions will not be found. While there are clear tensions between agricultural and environmental communities, it is clear that both sides cannot leave farmers and foresters alone to face the challenges of this century. It is time that both sides accept the necessity of the other, and that common solutions are needed; the environment needs a more sustainable farming system, but agriculture will also benefit from a stable climate and a healthy ecosystem.